George's Help Desk Tickets I PROMISE YOU, YOU HAVE TO READ THIS PAGE IF YOU'VE EVER DONE ANY SORT OF TECH SUPPORT. I am laughing so hard I am crying, I tell you I'M CRYING.... This would have KILLED me if it was ANY more funny!!!!!! 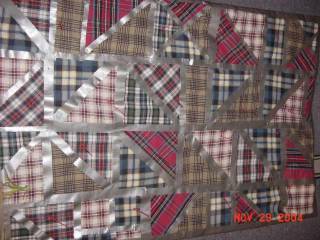 This is the MAN'S quilt, made by my mother's friend. He felt left out because all the "ladies" at his work were always talking about, and bringing in for "show and tell" the quilts that they had made. He really wanted to make fun of all the quilting that is going on in his office. So, he "made" this quilt over the weekend with duct tape and zip ties. He even did the binding on it (like a real professional) with duct tape!